Preparation of novel compounds with applications in polymerization and synthetic chemistry, the development of novel source materials for MOCVD applications, and the preparation of biomimetic calcium phosphonates to be used in bone cements and as bone scaffolding material. Deacon, G. B.; Junk, P. C.; Moxey, G. J.; Ruhlandt-Senge, K.; St. Prix, C.; Zuniga, M. F. Charge-Separated and Molecular Heterobimetallic Rare Earth – Rare Earth and Alkaline Earth – Rare Earth Aryloxo Complexes Featuring Intramolecular Metal-π-arene Interactions. Chem., Eur. J. 2009, 5503-5519. Gillett-Kunnath, M. M.; MacLellan, J. G.; Forsyth, C. M.; Andrews, P. C., Deacon, G. B.; Ruhlandt-Senge, K. BiPh3 – A convenient synthon for heavy alkaline earth metal amides. Chem. Commun. 2008, 4490-4492. Guino-o, M. A.; Campana, C. F.; Ruhlandt-Senge, K. A unique heterobimetallic calcium benzylate – an organometallic mixed metal species involving a heavy alkaline earth metal. Chem. Commun. 2008, 1692-1694. 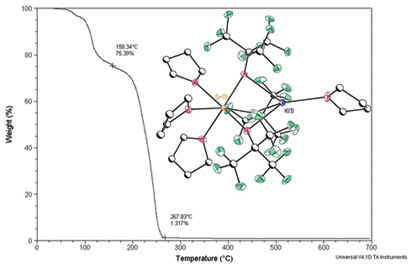 Alexander, J. S.; Teng, W.; Allis, D. G.; Ruhlandt-Senge, K. Alkali metal diphenylmethanides: synthetic, calculations and structural studies. Chem., Eur. J. 2007, 13, 9899-9911. Zuniga, M. F.; Deacon. G. B.; Ruhlandt-Senge, K. New structural features in heavy alkaline earth metal chemistry- molecular heterobimetallic Group I/Ba complexes. Chem., Eur. J. 2007, 13, 1921-1928.